That was the ambitious commitment made by AXA Group when in 2017 it joined the RE100, a global movement of companies committed to 100% renewable power. The deadline for achieving this goal? 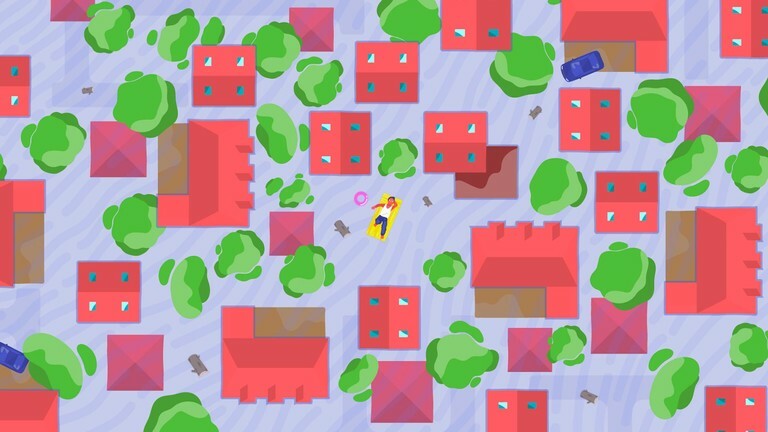 2025. For AXA Switzerland, a pioneering stakeholder in the fight against climate change, the mission is already complete. In the space of 10 years, the company has managed to become 100% renewable and to reduce its energy consumption and CO2 emissions by a third. A palpable serenity permeates the streets below the imposing AXA building in Winterthur (Switzerland). Employees gradually arrive at work. Petrol cars roll up somewhat discreetly. Two-thirds of the roughly 1,000 people working at the headquarters commute by train or bike – the new norm at the company that, 10 years ago, decided to launch its own unique battle against climate change. Since 2008, the Swiss branch of the AXA Group has been implementing a comprehensive environmental strategy. Ten years on, CO2 emissions and energy consumption are down by a third. We take a look back at a success story summed up in six steps. Benjamin Huber and Christian Joos are two of the architects of this transformation. The former is Head of Environmental Management at AXA Switzerland. The latter, as Head Facility Manager, helps integrate an environmental approach into all of the company’s internal actions. In particular, he is the one who negotiated the shift in the environmental paradigm. The “Superblock”, one of AXA’s main buildings in Winterthur, has been a certified low energy consumption building since its construction in 2014. 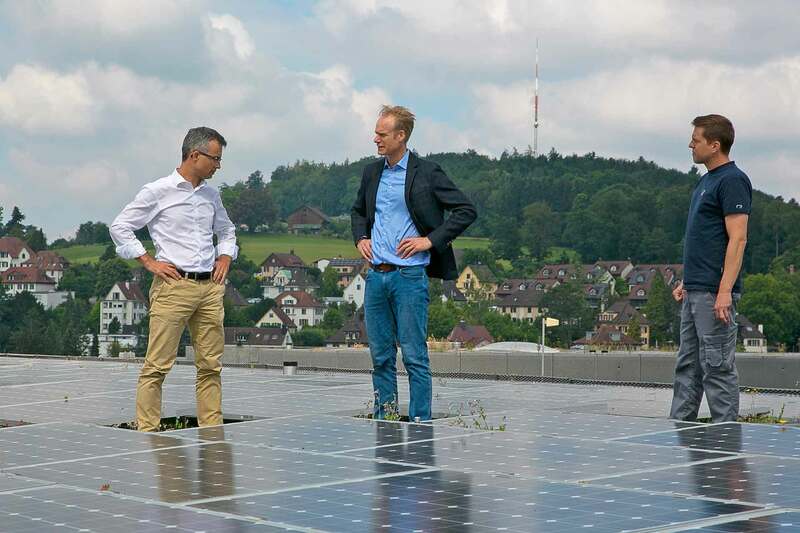 Just like AXA Switzerland’s sites in Lausanne and Zurich, it is equipped with solar panels. In 2008, AXA’s offices in Switzerland ran almost exclusively on hydropower energy (59%) and nuclear power (41%). Since 2009, 100% of the company’s electricity comes from renewable energy, with hydropower’s share of the energy mix rising to 97%. 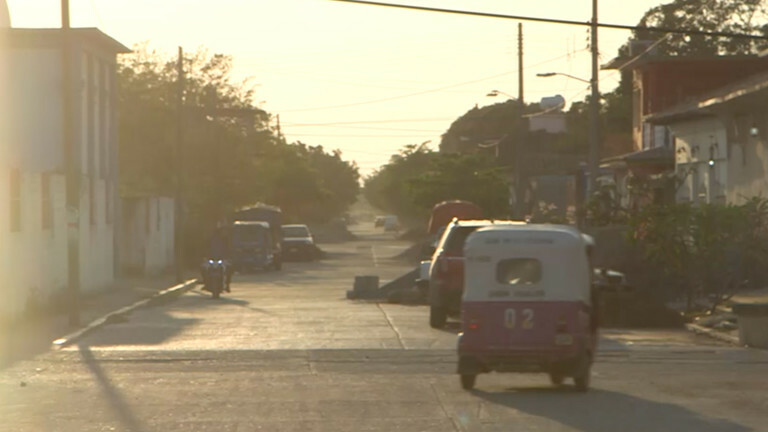 “Obtaining green energy is the simplest step,” according to Christian. “We asked our supplier to switch to renewables.” This change can take place overnight – provided that renewable energy solutions are sufficiently developed in the country in question, which is the case in Switzerland. 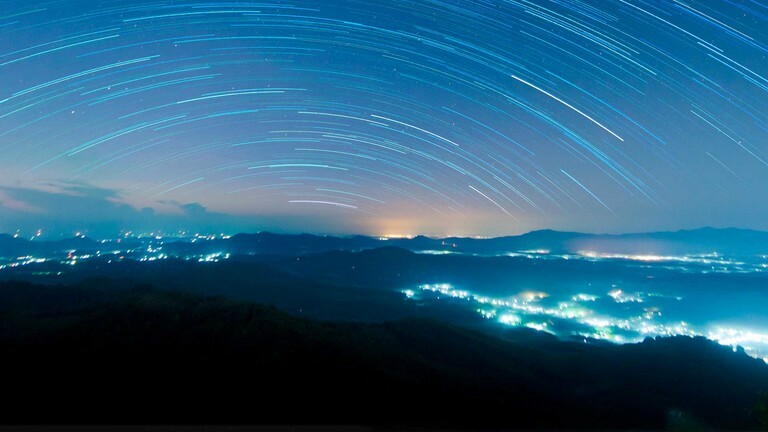 Ensuring true “energy responsibility” means obtaining a green electricity certificate from suppliers, which enables a client to trace the energy production sites. Here, an independent and certified body ensures the quality of the environment and the origin of the electricity provided by the supplier. Today, however, AXA Switzerland is preparing to go even further with its “Naturemade” label. This Swiss certification guarantees not only that the energy provided is 100% green but also that it respects the environment in a broader sense. 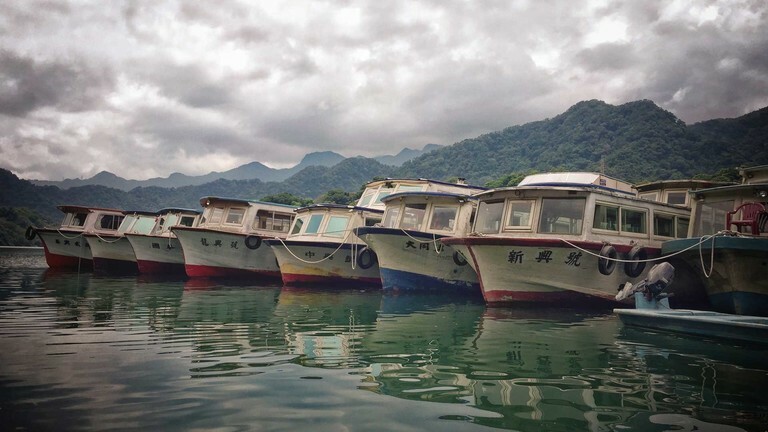 For example, hydropower plants boasting this certificate are equipped with an elevator that enables fish to migrate. Although hydropower is by far the most dominant force in the company’s energy mix, 2% of its energy comes from wind power. In order to tap into this green resource, AXA studied its client portfolio and discovered that one of the country’s biggest wind farms, Mont-Crosin, was on its books. This farm is capable of supplying 400,000 kWh per year: the equivalent of the annual electricity consumption of 150 households in Europe. In the entrance hall of the Winterthur building, some visitors glance at the TV screens intrigued. On the displays, there are a series of changing numbers. This is the real-time data on the volume of energy produced by the solar panels on top of the AXA offices just a few floors above. 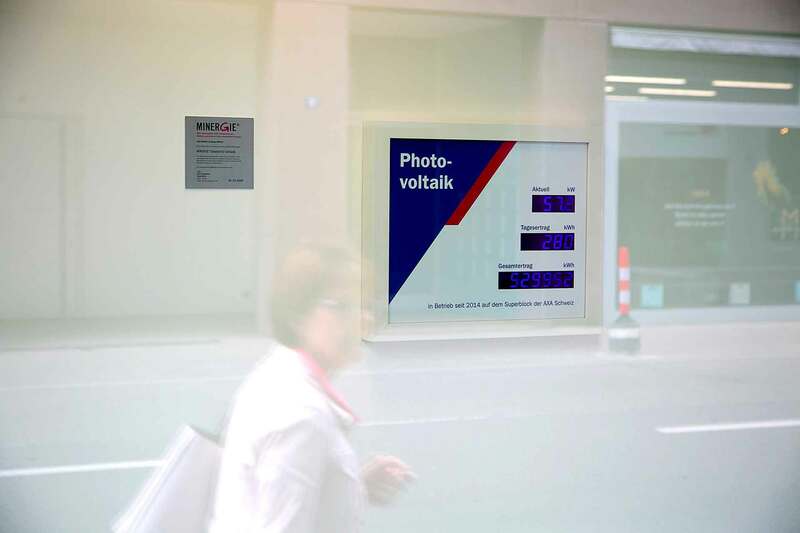 From the street, passers-by can follow the energy production – in real time –of the 520 solar panels installed on the roofs of AXA Switzerland’s different buildings since 2012. Next stop the rooftop, where, once we have negotiated the ladder to reach it, we find hundreds of solar panels capturing solar energy. 520 panels have been installed on different buildings since 2012. They provide 7% of the energy needs of the site. The total cost of this initiative: 866,000 euros. Christian Joos (left) and Benjamin Huber (centre) inspect the solar panels with technician Raphael Mühlethaler (right). Once a year the panels are cleaned, which increases their productivity by 10%. The weeds that have begun to spring up between the panels are also rooted out. For example, the students taught them that cleaning dust and dirt from the panels once a year, can enhance productivity by 10%. Switching to renewable energy has a cost. But although the price of fossil fuel energy is currently considered to be cheap, Christian is convinced that there is a risk that the cost will skyrocket in the mid-term. With this in mind, working to reduce energy consumption has become vital for companies, whatever their energy mix. At AXA Switzerland, such consumption has dropped 30%, and the objective is to cut it by 4% each year. Plastic bottles have been replaced by free water fountains. When it comes to reducing energy consumption and your carbon footprint, every little helps. 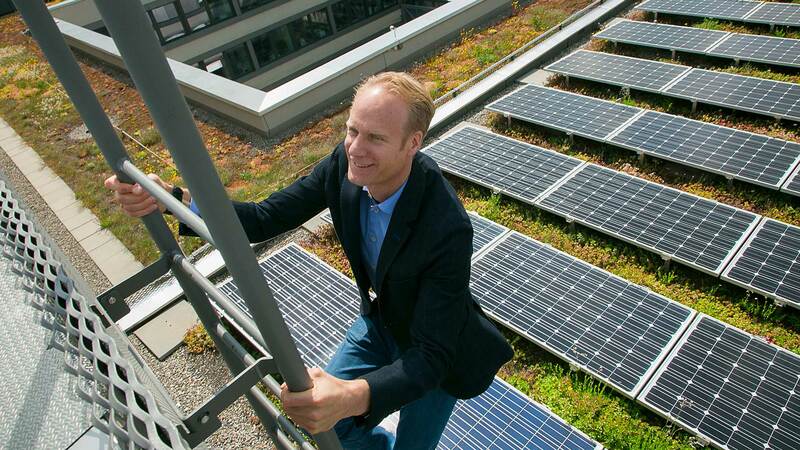 This is an easier task to achieve at Winterthur than elsewhere: the main headquarters building, set up in a former factory, was built in 2014 in order to obtain a low energy consumption certificate. 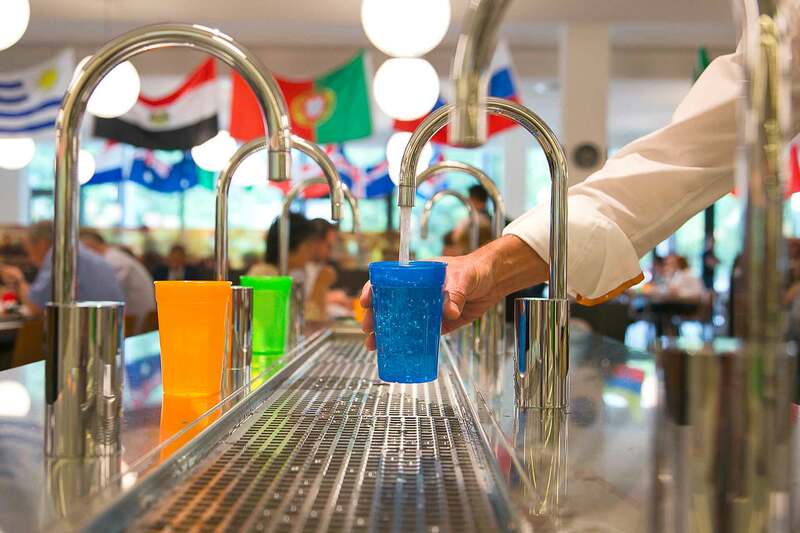 It is a workplace that Christian and his team try to improve on every year, by installing sensors that turn off lights automatically in offices that are not in use, for example, or by switching out plastic water bottles for water fountains. Paper consumption, thanks to the growing digitalisation of workstations, has dropped from 33.8kg per person per year to 12.9kg. The most recent example involves the cooling system for the site’s four data centres, which are by their very nature energy intensive. Now, the air conditioning system used to cool the hardware runs on energy provided by a neighbouring waste management site. 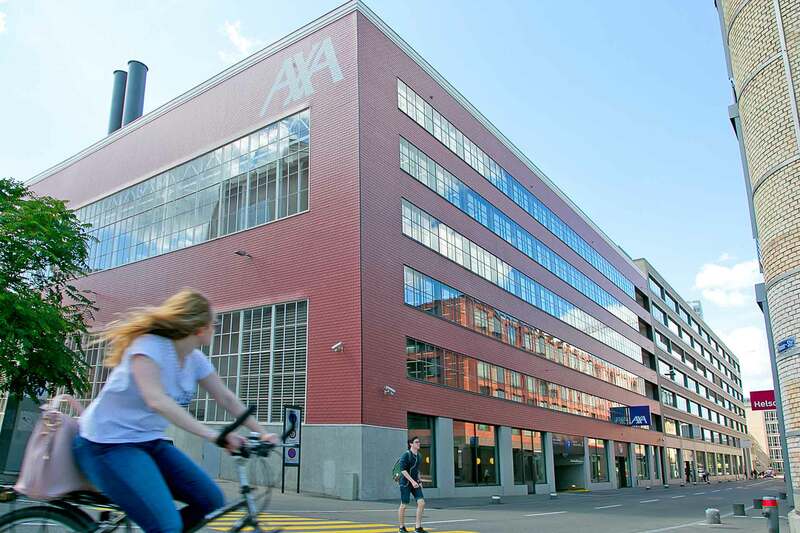 Of the 4,400 tons of CO2 emitted each year by AXA Switzerland, the buildings themselves account for only 900 tons. The rest stems from “mobility” sources, in the broadest sense of the term: business trips (1,100 tons) and, above all, daily commutes (2,400 tons). Today, the majority of employees use what can be described as “clean” modes of transport. Electric bicycles can be found quietly charging in the building’s basement. It stands to reason, therefore, that a major effort was needed in this area. Since 2014, AXA Switzerland has been offsetting all of its CO2 emissions linked to business trips by working in partnership with Myclimate and other organisations that specialises in fighting climate change. 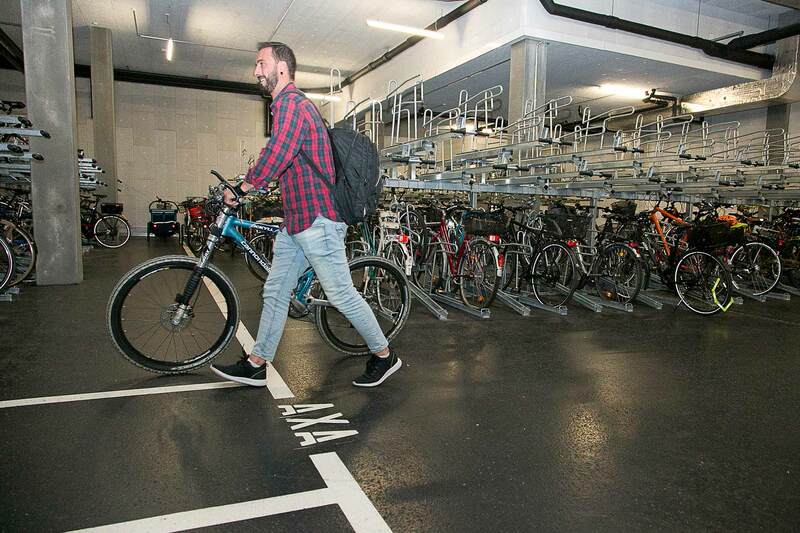 Some “alternative solutions” are hidden in the basement: In an underground car park with space for some 300 bikes, several e-bikes are left to charge while their owners work upstairs. On-site showers enable those who cycled in to freshen up before beginning the day. With the introduction of Flex’Work, every employee works from where they deem fit. This flexibility has led to a reduction in the number of workstations needed and, as a consequence, a drop in energy costs. To fight against pollution linked to transport, AXA Switzerland has adopted the “Flex’Work” initiative. Also known as Flex’Office, this new form of organisation consists of no longer attributing a fixed workspace to each individual employee. Every morning, therefore, each employee chooses where they will spend their working day. What’s more, every employee has their own luggage cart where they can store their computer and any useful documents under lock and key. Another major by-product of Flex’Work is telework, which leads to a reduction in the total number of offices used. 10% of the company’s employees participate in teleworking. 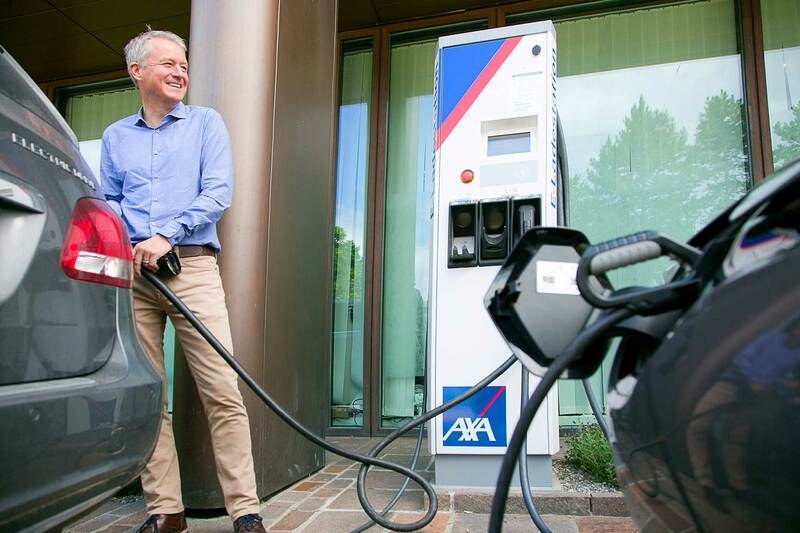 In front of one of AXA Switzerland’s buildings, a fast charging station is available to clients who own electric cars. Within 60 minutes the vehicle battery is charged to 30 - 80% of its full potential - with a standard wall socket this would take several hours. For e-car drivers, thanks to a partnership with the company Swisscharge, a network of 20,000 charging points has been identified and made available via an application. A fast charging station set up at AXA’s site is also available to clients. 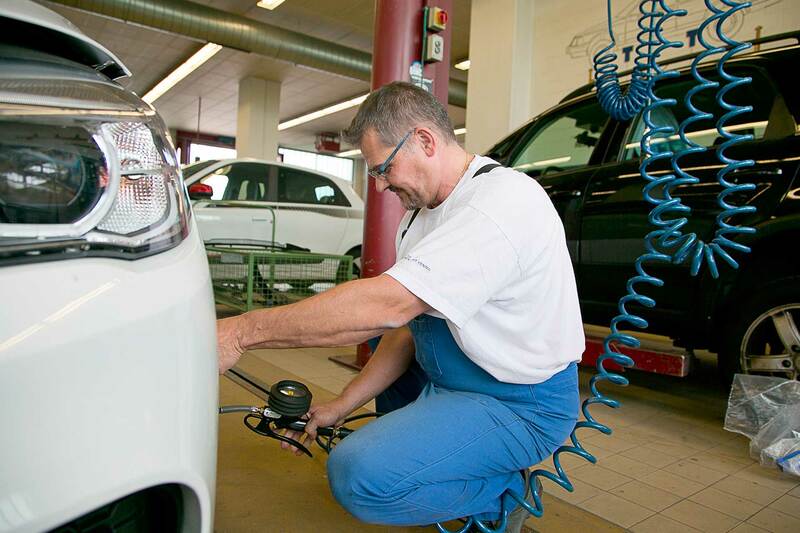 Checking tyre air pressure and air conditioning… Since 2018, every AXA Switzerland client can benefit from a free energy consumption evaluation for their petrol vehicle in one of the 200 garages in the country certified to carry out such diagnoses. 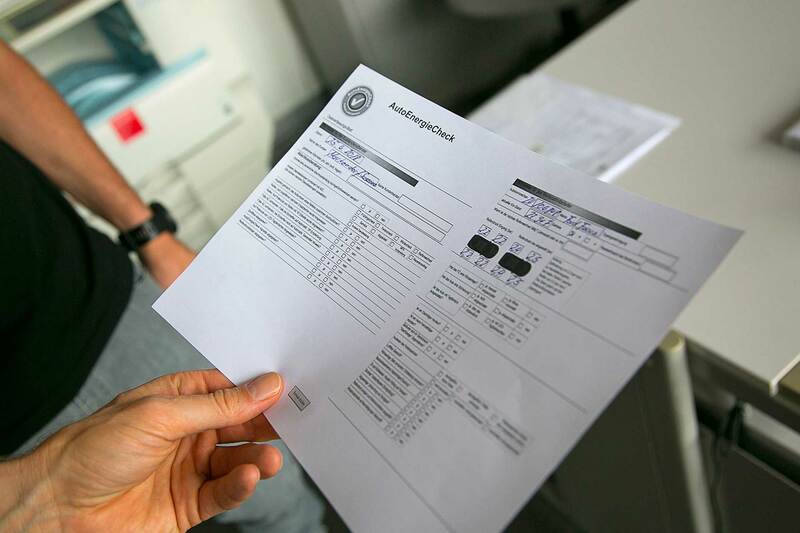 This is a check-up which enables clients to save around 300 euros a year, and reduce CO2-emissions by 0.6 tons. Although it is at the forefront of the fight against climate change, AXA Switzerland is not the only branch in the group that stands out in this area. In Spain, for example, AXA has also made the transition to renewables. They have kept their local energy supplier, but have cut reliance on fossil fuels, meaning renewable electricity has risen to represent 95.35% of their energy mix. Italy has made similar commitments at the headquarters in Rome, where 100% of electricity is renewable. 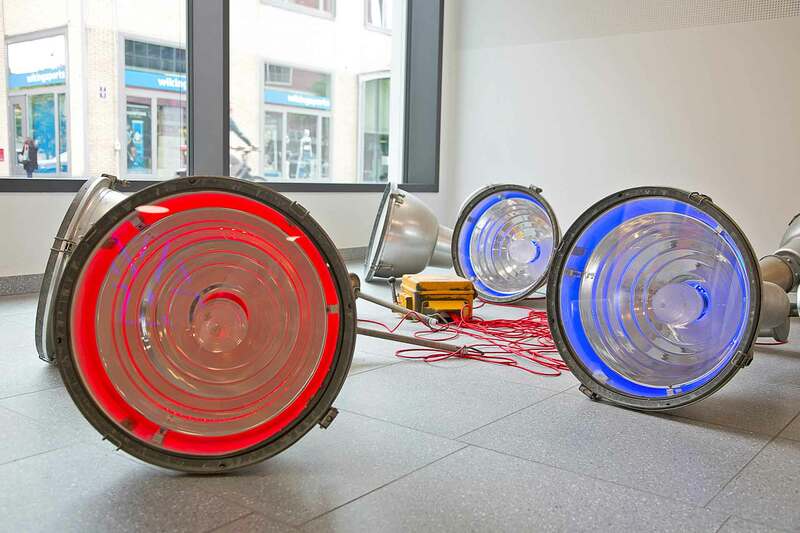 While hydropower makes up the lion’s share in Switzerland, Rome has adapted to its environment and has installed several heat pumps for the air conditioning systems in its offices in Rome and Milan. Finally, to reduce its carbon footprint linked to transport, they have bought a series of hybrid vehicles.